Set in the backdrop of 1990 Calcutta, She is a story about finding one’s own identity in spite of all odds. The story spins around the life of Kusum, a brave heart whose identity is often untitled and blurred; it does not belong anywhere, definitely not under the ‘he’ or ‘she’ bracket, thanks to our social conditioning. Will she be successful in her mission? Find out in She, an utterly absorbing read that derives inspiration from Tagore’s “Ekla Cholo Re” song, which urges everyone to move on despite the fear of abandonment from others. 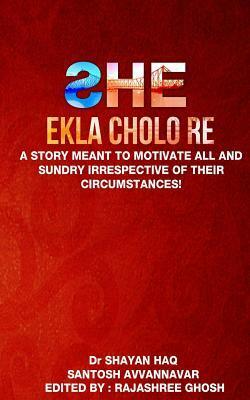 'She' is the story of a transgender Kusum, who is born as a male, but dominated with female traits. The story mainly focuses on how society treats transgenders. It shows how our society has set some expectations from long time based on gender. If someone is not fitting into either of the gender types, our society tries to ignore or avoid them and cannot accept and include them. The book cover is designed well as per the story. The narration is good and easy to follow. The climax is very good. I don't know much about Rabindranath Tagore's song 'Ekla Cholo re' and its meaning until I read this book. This has some verses from that song with translation in English. Shayan is a medical doctor and cosmetologist by profession working at Bijapur, Karnataka. He is born at Gaya, Bihar and spent his quality time at West Bengal and Bihar before he moved for higher education. In his free time he loves to drive, read, watch and discuss on movies, and a gadget freak. PS: Received a free review copy from the author and this is my honest opinion on the book. I studied cultural anthropology in college back in the early 1970's. Several works I studied included information on how trans gendered people were treated in other societies. I remember a couple of societies where they were considered to be people of great power (as healers or "medicine men")with links the supernatural, but, for the most part, their lives were not happy. It s good we are finally facing this head on in the United States, where I live. Discrimination exists in so many ways. Good on those who have the courage to speak out against it. 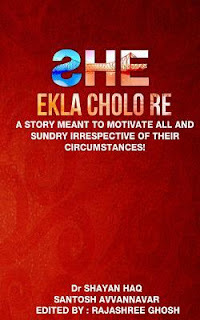 Ekla Cholo Re is an inspirational song. Thanks for sharing this.